Baked Gujjia: made of whole wheat and semolina instead of refined flour and stuffed with nuts, coconut grated and dipped in healthy honey. Ragi Malpua: made of ragi flour, whole wheat and oats, makes this version of all time Holi favorite the healthiest to eat and offer. Channa Masala with Baked Kachauri: a plateful of spicy and tempting channas (chick peas) served with baked kachauris. No one gets to complain on calories. The festival of colours is celebrated in different way in every region in their own style. 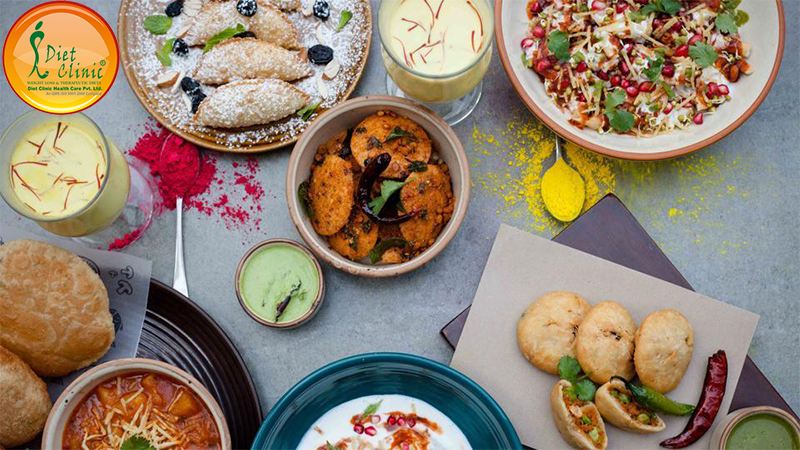 But one thing is common in every region in India is the mouth-watering savories that are prepared and served during Holi. This Holi, let’s get healthy and make others healthy too with special Holi recipes from Diet Clinic. With these recipes we now don’t have to restrict yourself from enjoying all your favorite Holi dishes. Shahi Poli: a healthier version of the popular Holi dish Puran Poli, is made out of low fat mawa, whole wheat flour, semolina and minimum ghee with all the royal taste. Oats Chaat: while a traditional chaat consists of too many calories, try the oats chaat from Diet Clinic which is not only rich in fiber content but is also relatively low on calories. And afraid not it is still as yummy as the original version. Low Calorie Thandai: Holi stands incomplete without its Thandai. This Holi try the Diet Clinic’s low calorie version and enjoy guilt free the traditional Holi drink.